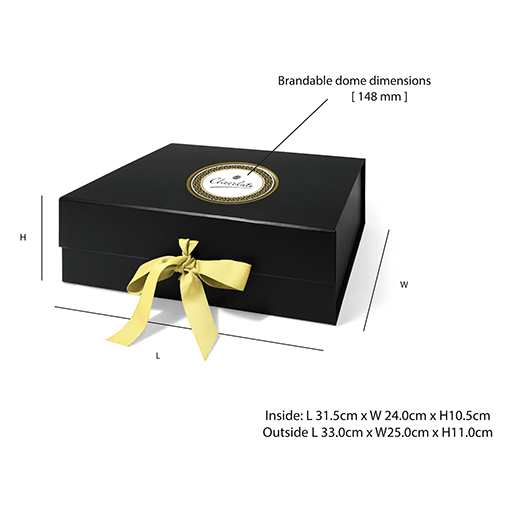 Maxi Luxury Chocolate Collection Gift Box (With Full Bottle of Champagne) branded with a full colour digitally printed domed label on the lid of the box. The gift box contains 1xLarge share tin with Belgian choc chip cookies, 1x Gold Gift tin with 12 Praline Chocolates, 1x 100g Orange Chocolate bar, 1x mini tree tin with 9 gold and silver foil balls, 1x Hot Chocolate and mallows on a spoon, 1x Chocolate duo bar, 1x Special edition caviar tin, 1x Organza bag filled with 10 Gold Coins, 1x Gold Walnut Whirl, 1x Carousel Money Tin. Full bottle of Champagne included.